The Instant Pot magic begins with simple base for the vermicelli pudding, flavored with aromatics like cardamom. Then layered on top of some homemade strawberry compote, it has the perfect balance of sour and sweet! Enjoy the harmony of flavors and marvel at the texture of this gorgeous Strawberry Vermicelli Kheer Pudding by trying it today! 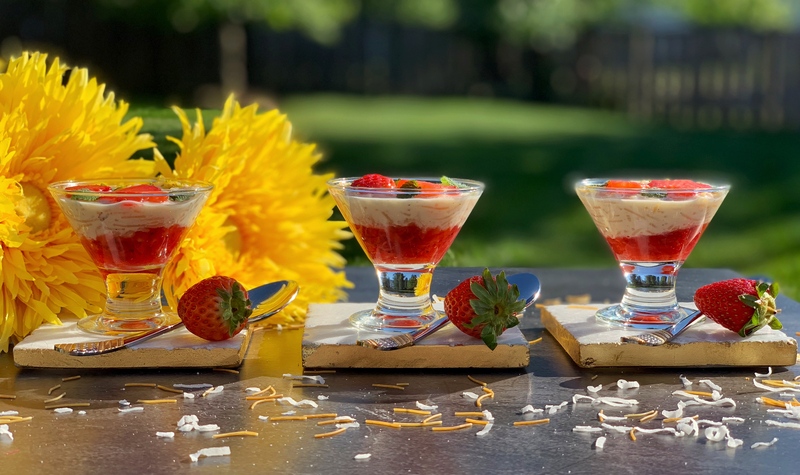 This lusciously smooth, silky, and elegant Instant Pot Strawberry Vermicelli Kheer Pudding is an easy-to-make dessert, the perfect way to end a meal. Preheat the Instant Pot on sauté mode and once the inner pot is hot, add in the vermicelli, nuts, and ghee. Roast them for 2-3 minutes or until it becomes fragrant. Pour in the milk, saving 1 cup for later, and add the condensed milk, coconut milk, and salt. Stir them together, and take the Instant Pot off sauté mode and put it on the porridge setting once you close the lid. Set the timer for 15 minutes. Make sure that the vent is in the sealing position. Once the 15 minutes are over, turn the Instant Pot off, and quick release the pressure using a towel to cover the vent (so it doesn't splatter). Once you unlock and remove the lid, it may seem like the milk had curdled a little, but don't worry about it. Put the Instant Pot back on sauté mode and add in the remaining milk that we had saved before. Add in the cardamom powder and stir the kheer pudding, achieving the desired consistency. Take the kheer out into a separate dish and keep it in the fridge to chill. Clean out the Instant Pot's inner pot and then again preheat it on sauté mode. Then add in the strawberries, sugar, lemon juice, lemon zest, and salt. Stir the ingredients together. Put the lid back on and cook it on manual mode for 2 minutes. Once done, quick release it using the towel and remove the lid. Mix together the corn starch and water and add it to the mixture, putting it back on sauté mode. Stir it together and let it simmer for a few minutes until translucent. Chill the compote. For serving, put the compote on the bottom and then the kheer pudding on top. Garnish with some strawberries, mint, and crushed pistachio. Enjoy! For the stove-top recipe, follow the same steps but in a non-stick pan, instead of Instant Pot. However, when you add the milk, make sure to thicken and reduce it for roughly 15-20 minutes before continuing with the rest of the steps. The amount of vermicelli can be adjusted to change the consistency of the kheer as per your liking. Increase it for a thicker pudding.